Red Dead Redemption. Just Cause 2. Occasionally a game comes along with a world so vast filled with so much to do, that I just get lost for hours in it, often forgetting that there are missions that I'm supposed to be doing to push the story along. Far Cry 3 is one of those games. Your virtual playground this time around is the Rook Islands, a pair of tropical islands somewhere in the South Pacific locked in a war between drug-running pirates and the native Rakyat people. Enter Jason Brody and his seven friends and brothers, a group of college buddies of the rich and beautiful variety, who want to put an exclamation point on their South Pacific romp by skydiving over the Rook Islands. Need I mention that things go wrong? Horribly wrong? They parachute themselves right into the hands of psychotic drug lord Vaas and his men, who throw them in bamboo cages and plan to ransom them off or sell them into slavery. Jason and one of his brothers manage to make their escape, and that's where you come in. As Jason, you must transform yourself from pampered college boy into a one-man killing machine in order to rescue your friends and help the Rakyat rid their home of the pirates. With this setup you'd probably expect your typical one-man army on a rescue mission action game storyline. While there's certainly plenty of that here in Far Cry 3, the game does manage to keep things interesting by mixing in elements of mysticism and tribal rites of passage along with a cast of characters who are all psychologically unbalanced to some degree, and some more than others. It all makes the game feel like it has a slight bent towards the surreal, which is further reinforced by the amalgam of tropical themes that makes you wonder if the game's designers knew that the Caribbean and South Pacific are separate and distinct regions. The Rook Islands' touch of an identity crisis is easy enough to forgive since they are so large and filled with things to do and places to explore. There's always an active story mission for you to pursue, but you can take them on at your leisure. In fact, the game encourages you to do more on the islands than just race through the story missions by often placing the next trigger point deep in unexplored enemy territory. The primary activity outside of the story missions involves the war between the Rakyat and the pirate occupiers, as in helping the Rakyat you in turn help yourself. The islands are divided into a number of sub-regions, each of which has a radio tower and one or more enemy encampments and strongholds. When captured, these towers will reveal the map for their regions, giving you insight into the layout of the roads, land and water features, and special locations. In spite of their strategic value, these towers are left unguarded but reaching the top of the rickety towers to activate them will involve some creative acrobatics on your part. Luckily you only need to work out how to reach the tops of the towers; you'll have a couple of ziplines to choose between for your descent. Enemy camps allow the pirates to exert influence over a region, which means that you'll be vulnerable to ambushes, harassment by patrols, and encounters with sentry outposts. There are other advantages to capturing these camps beyond making it safer to go for a stroll. Once you take a camp Rakyat fighters will arrive to garrison it, which means it will be the Rakyat patrolling the local area instead of the pirates. The camps also become fast travel locations for you, allowing you to jump between the network of friendly bases at will, with just a short wait for a loading screen between them. And since each camp usually has one or more vehicles nearby, you can quickly cover more ground after arriving at a camp. Each friendly camp will also contain an automated weapons shop, allowing you to purchase ammo, sell loot, and swap weapons and customize their attachments. 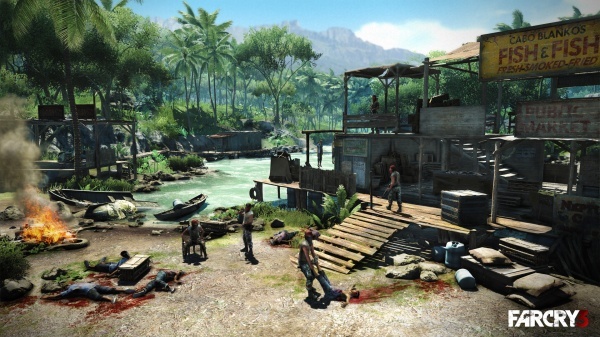 Lastly, camps serve as locations to pick up assassination and hunting side missions. Taking an enemy camp requires you to kill its garrison first, but you have a lot of freedom in choosing how you dispatch that garrison. You can use stealth to sneak around the camp killing the enemies one by one from behind, although oddly enough the ability to drag bodies out of sight is a skill that must be acquired through the game's RPG-like skill tree feature. Alternatively you can try to snipe each enemy from afar, or set fire to the camp and watch them burn, or free a caged tiger and let it run amok, or rain RPG rounds down on them, or, well, you get the idea. Even though you have a large degree of freedom in deciding how to go about capturing a camp, you'll often find that taking the stealth approach is the most prudent, at least until you can manage to disable the camp's alarm system. If you don't disable the alarms, once the enemy is aware that you're there they'll sound the alarm, reinforcements will soon arrive, and you'll find yourself facing a larger and better armed enemy force. After a few of these assaults I began to wonder if the camp attacks would devolve into a repetitive exercise, but before long the variety of camps and the enemies defending them became apparent. One time you're trying to assault a hilltop fort bristling with snipers on elevated platforms, the next a camp backed up against a large cliff face, and the next a base on a small island just offshore. You'll need to approach each new camp carefully and do a little scouting before you decide which approach will work best with it. Making a poor choice and taking the wrong tactical approach can make things quite difficult for you quite quickly, The enemy AI can be pretty challenging - enemies are quite competent in using cover effectively, using mounted weapons, and in flanking you. In fact, some of the game's more exciting moments come when a camp assault goes seriously south and you're forced to think and react fast in an attempt to save yourself from your misstep. The animals factor into the gameplay in several ways beyond making you the star of numerous "When Animals Attack" vignettes. You'll find numerous hunting challenges around the island that task you with things like sniping at deer or hunting tigers with a bow, with experience and cash as your rewards. The animals also factor into the game's crafting system. After you kill an animal you can skin it, and the animal pelts can be crafted into things like larger ammo belts, slings that allow you to carry more weapons at once, and rucksacks to store your loot. The crafting system is an interesting idea, but its execution leaves a bit to be desired. You can only see what types of skins you need for the next tier of items, so you end up holding on to a variety of skins just in case you might need them soon and eating up your precious inventory slots. The crafting system also requires you to take the time to hunt in order gain access to important capabilities such as carrying more weapons simultaneously. While you'll encounter animals fairly often, finding the right animal when you need it can be a tricky endeavor, even though the game's map marks some of the various animals' habitats. And once you've used a particular animal's skins to craft an item, those skins lose most of their value to you. Pelts can be sold in stores, but the prices don't seem to match the level of effort required to collect them in the first place. Gathering the local flora is easier than tracking down the fauna, and the plants you gather will be useful to you throughout the game. Plants yield different colored leaves, and these leaves can be used in different combinations to craft syringes with a number of benefits including healing, reducing damage taken from fire, enhanced animal tracking, and the ability to hold your breath under water for a longer period of time. Other island activities include optional side missions, supply drop runs (checkpoint races), Trials of the Rakyat challenges in which you must kill as many enemies as possible with a given weapon before time expires, and more peaceful pursuits such as poker games. In addition, there are hidden idols to discover and collect, as well as letters left behind by combatants on the island during World War II. In short, there's a whole lot to do here, and even if you don't manage to do everything there is to do you can easily put well over forty hours into the game before you reach the end of the story. Not that a game this large really needed it, but in addition to the single player sandbox there is also a co-op campaign and a competitive multiplayer mode. The co-op missions are far more directed than the open world single player gameplay and the going can be tough if you take them on with fewer than the four players the missions support, but they're a fun addition nonetheless. 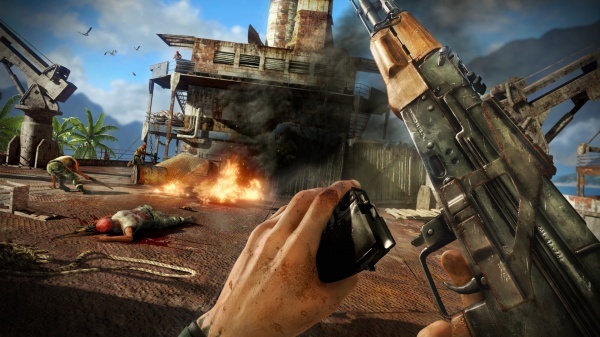 The multiplayer gameplay is pretty much what you'd expect from a marquee shooter, although there are some interesting Far Cry style twists such as ziplines and a game mode in which the goal is to torch the opposing team's base. The maps look gorgeous, sharing the lush tropical environments found in the single player game, the controls are tight, and the gameplay fast and lag-free. Frankly, I wanted to spend so much time with the single player game that multiplayer felt like a bit of an afterthought to me, but I did have fun with the time I spent in the multiplayer mode. While there are some quirks with the game and I did encounter an occasional bug, overall I really enjoyed the time I spent with Far Cry 3. There were always one or two more things that I wanted to accomplish before I stopped playing the game, and I was continually impressed with what I found as I pushed further into the islands. I haven't played many games in which I found myself pausing time and again just to look around and take in the views. Far Cry 3 is a very impressive game, one of the best of 2012, and will certainly make the list of most memorable games that I've played on the Xbox 360. Final Rating: 94%. An experience that's a far cry from the average shooter.